Iowans who experienced the floods of 2008 are closely watching forecasts, as rain continues and river levels rise, potentially to near-record flooding. As of Saturday afternoon, (Sept. 24, 2016) the National Weather Service had moderated its flood stage prediction for the Cedar River in Cedar Rapids, back down to 24 feet by Tuesday morning. Uncertainty, however, remains on forecast rainfall and how water routes through the river system, the Weather Service noted, adding that forecasts may change. On Friday afternoon, (Sept. 23, 2016) the National Weather Service had revised its flood warning for the Cedar River in Cedar Rapids to a higher level. The river was predicted to rise above flood stage Sunday morning and continue rising to 25.3 feet Tuesday morning, up from an initial prediction of 24.1 feet. The river should finally fall below flood stage Friday morning. The Weather Service noted the impact: at 24.2 feet, water reaches the bottom of the 1st Avenue bridge deck in downtown Cedar Rapids. Several areas of Cedar Rapids that were devastated by the catastrophic flooding in 2008 are preparing for similar inundations of water from the Cedar River. CEDAR RAPIDS, Iowa (September 24, 2016) – The National Czech & Slovak Museum & Library (NCSML), including its exhibitions, will remain open today, Saturday, September 24. The museum will be closed on Sunday, September 25, and expects to be closed through September 30. Updates will continue to be posted at NCSML.org. The Wonderful Warhol Family Art Workshop scheduled for today and the film screening scheduled for September 28 have been cancelled. Immortal: Warhol’s Last Works will be closed beginning on Sunday, September 25, and will not reopen. Thank you for your understanding. Volunteer sandbagging efforts for museum-owned buildings in Czech Village will begin today at 10 am. If you can help, please meet in the circle drive in front of the NCSML located at 1400 Inspiration Ave SW. The NCSML is concerned for our neighbors in Czech Village and New Bohemia and will be helping in any way it can. The museum encourages anyone who is able to assist with flood preparation in affected neighborhoods. The National Czech & Slovak Museum & Library (NCSML) is preparing for the floods predicted for the Cedar River the week of September 26. The main building, artifacts and library collection are in no immediate danger due to flood protection measures put in place when the museum was rebuilt after the flood of 2008. However, the NCSML is preparing for the potential of water in the garage level, which was also designed to withstand this type of event. In addition, the NCSML owns three properties in Czech Village and is doing all it can to work with the tenants to prepare for water in the basements and first floors of buildings. Please check the website at www.ncsml.org for further updates. Update from the Cedar Rapids Police Department, 5 p.m. Sept. 23: The NewBo Market sandbagging location near 11 St. SW is closed. The City is opening another sandbagging location at the old K-Mart location at 16 Ave. SW and Williams Blvd. SW. The sandbagging locations at Ellis Park Pavilion and 5th St. NW and K Ave. NW are still operating. The public is encouraged to go to one of these three locations if they need sandbags or would like to help with sandbagging efforts. Volunteers should bring shovels. From ReStore on Friday, Sept. 23: We are in dire need of help today! We have two semi-trucks arriving that we need to fill tonight! If you can help please just show up at ReStore, 350 6th Ave SE Cedar Rapids. (Update on Sept. 23, 2016, from NewBo City Market) Pick-up for sandbags at Ellis Park or 6th Ave and 16th St SW. The city is asking people to stay away from the NewBo area for the time being. From the Iowa Valley Food Co-op: The Cedar River is projected to crest at major flood levels on Tuesday, Sept. 27, in Cedar Rapids. Our location at Matthew 25 is in the path of potential rising flood waters. Iowa Valley along with Matthew 25 will be evacuating valuables from the building this Saturday, Sept. 24. We need your help, please. Join us at 10am at Matthew 25 (201 3rd Ave SW) to: help move equipment out of the building; lend a truck or trailer to help with evacuation of IVFC equipment, and potentially Matthew 25 needs and assist with sandbagging the building. Also, if you can offer 400 sq ft or more of warehouse space to be used temporarily please be in touch with Iowa Valley Food Co-op. St. Wenceslaus Church, 1224 5th St. SE, is asking that volunteers meet at the church at 10 a.m. this Friday, Sept. 23 to help with sandbagging. Projected river levels would mean water on 5th Street and possibly up to the church doors. Any available people and trucks/large vehicles are needed. The Artisan’s Sanctuary, 45 16th Ave. SW, in Czech Village needs helps packing up everything in their building. Undoubtedly, other Village merchants could also use help, too. Czech Village Antiques, 82 16th Ave. SW, is in need of hundreds of sturdy boxes to pack up their merchandise. Please drop off after 10 a.m. Friday, Sept. 23. Additionally, sandbagging efforts will continue to take place on 11th Ave SE next to the NewBo City Market. The market will be closed Friday, Saturday, and Sunday to prepare for the predicted flooding. The City of Cedar Rapids has set up a sandbagging station at the Market. We need volunteers to help fill and place sandbags around the Market and at other New Bohemia District businesses. Sandbagging is scheduled to begin at 5pm tonight (Thursday, Sept. 22, 2016) and run through the weekend. Volunteers are asked to bring shovels. CEDAR RAPIDS, Iowa (September 22, 2016) – The National Czech & Slovak Museum & Library (NCSML) is preparing for the floods predicted for the Cedar River the week of September 26. The main building, artifacts and library collection are in no immediate danger due to flood protection measures put in place when the museum was rebuilt after the flood of 2008. However, the NCSML is preparing for the potential of water in the garage level, which was also designed to withstand this type of event. In addition, the NCSML owns three properties in Czech Village and is doing all it can to work with the tenants to prepare for water in the basements and first floors of buildings. Volunteer sandbagging efforts for museum-owned buildings in Czech Village will begin Friday, September 23, 2016 at 1 pm. If you can help, please meet at the Kosek building located at 87 16th Ave SW. The NCSML is concerned for our neighbors in Czech Village and New Bohemia and will be helping in any way it can. The museum encourages anyone who is able to assist with flood preparation in affected neighborhoods. The NCSML will be open for business as usual on Friday, September 23 and Saturday, September 24. Please check the website at www.ncsml.org for further updates. 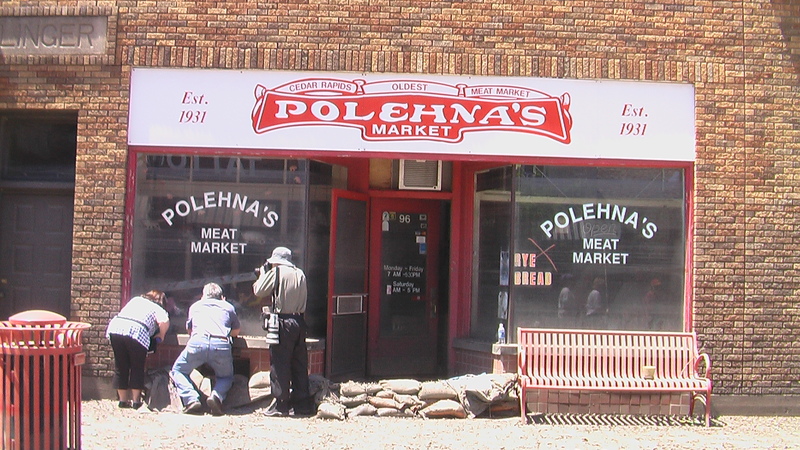 The NCSML is in contact with Czech Village New Bohemia Main Street and the City of Cedar Rapids. DES MOINES – People with private drinking wells in flooded areas are being urged by the Iowa Department of Natural Resources to use caution before using water from those sources. Extensive rainfall and the resulting flooding over portions of north central and northeast Iowa have also caused a number of wastewater treatment facilities to overflow. Some of the facilities have had to bypass untreated wastewater to prevent backups into homes and businesses. In all, 38 different wastewater facilities had reported excess water-related issues by Thursday afternoon. People are advised to use caution in and around flood waters primarily for their physical safety, but also because high waters can also carry debris, bacteria, and diluted wastewater. Wells that get inundated by flood waters are exposed to contamination such as bacteria, viruses, farm chemicals and other potential pollutants. Wells that are located in low landscape positions or in areas near streams, rivers or waterways, are especially susceptible to flood waters and the associated water quality problems that flooding can cause. “Even if your well wasn’t completely inundated with flood water, it could have been contaminated if one of your neighbors’ wells was flooded or there are structural problems that allowed flood water to enter,” said Bob Libra, state geologist for the Iowa Department of Natural Resources. Residents with wells in flood impacted areas are urged to use alternative sources of water until their water systems can be checked by an Iowa DNR certified well contractor. “In most cases, shock chlorination will be effective in disinfecting the well, but disinfection will not provide protection from pesticides, heavy metals, fuels, oils and other types of non-biological contamination. We would urge people to contact their local county health department or the State Hygienic Laboratory at the University of Iowa for more information if they believe these types of contaminants might be in their well,” said Libra. The heavy rains have also led to flooding and the closings of George Wyth State Park in the Waterloo-Cedar Falls area and the Yellow River State Forest area in Allamakee County. “We have all the campers out of George Wyth and thought it best to close the rest of the park since all the roads will be under water,” said Scot Michelson, DNR state park district supervisor. According to Michelson, all four campgrounds in Yellow River Forest will be closed through at least the weekend. “We will have to assess any damages in both areas after the water recedes before deciding when we can reopen,” says Michelson. The annual Ft Atkinson Rendezvous at Ft Atkinson State Preserve will still be held this weekend. People planning park visits in the near future, especially in areas with recent rain events, are reminded to check on current conditions before heading out. Closure information and alerts regarding Iowa state parks can be found at http://www.iowadnr.gov/Places-to-Go/State-Parks-Rec-Areas/Closure-Information or by calling individual park offices. The Elk Creek Pool “C” Wildlife Management Area boat ramp is not usable due to high water and the county road is closed accessing the boat ramp at Hanlontown Slough WPA, both in Worth County.